Charles Donelan has sent in this fascinating questionnaire covering his dancing odyssey through some legendary clubs in New York and elsewhere with a cast including Madonna and the Jesus & Mary Chain. Charles writes regularly on arts and entertainment for the Santa Barbara Independent, but really should get working on that book on 1980s New York! First ever was probably to some classic rock cover band in the junior high cafeteria. Or was that the gymnasium? But really dancing—for me that started in New Haven , CT , USA around 1979. People danced to the new wave and punk music of the time, but that was where I also began to hear the first Sugarhill records, and to dance to James Brown, Fela, and Parliament/Funkadelic at parties in dining halls or at people’s apartments. This was fun but still essentially random, just college kids messing around. By the time I moved to New York City in 1982 I had discovered the Mudd Club, Danceteria, and the Pepp ermint Lounge, where people were dancing to the Bush Tetras, the Feelies, James White, Konk, ESG, and other new wave bands of that era. But this was also when “The Message” broke, and a lot of other great early hiphop, and I can remember hearing it for the first time on club dance floors at places called things like “Fallout Shelter” that closed after a month and thinking this is big. At first people did the same new wave style dance to the hiphop beats, bent at the waist and knees, crossing their arms and legs rhythmically, low in front, and popping up at exciting moments, and spinning 360 or 720 degrees. When I started working as the elevator boy at Danceteria in 1983 (flyer left), the second floor dance area had a range of steady DJs who were all in Rockpool—Mark Kamins, Ed Bahlman, Walter Durkacsz, and Johnny Dynell—and they all had the signature New York sound—a mix of hiphop, disco, rock, funk, and what we now call “80s,” all filtered through these really loud, really noisy sound systems and mixed with way too much cheap phase shifting etc. All the kind of cheesy effects that you can still hear on something like Armand Van Helden’s New York a Mix Odyssey CD. Around 1983 everyone started to go to the Roxy roller disco on Thursday nights to hear Afrika Bambataa. There was crazy break dancing going on there, with an “Everbody”-era Madge right in the middle of it [Madonna's was the last record played at the Roxy's gay club earlier this year - even if she didn't turn up personally - Neil] . Malcolm Mclaren hired young teenage doubledutch rope jumpers from Harlem to perform at 3 in the morning to premiere “Buffalo Gals.” My gf and I were in the Roxy VIP with Daryl Mac, Run, and John Lydon. If you want an idea of what the sound was like, think the loudest system ever, turned up. Each week they premiered a song—I can remember being there for the premiere of “Last Night a DJ Saved My Life.” To make the people really dance, Afrika played just the first two bars of “Hey Mickey!” for five minutes. 2.What’s the most interesting/significant thing that has happened to you while out dancing? Connecting with other people. There are certain things that only come out on the dancefloor, and great music takes people far out of themselves. I have met and befriended individuals through going out dancing who have changed my life, and my interest in nightlife has had an impact on my career. But the most significant things that happen while out dancing are the excitement of the moment and the intensity of the memory impressions that it leaves. Nell’s on West 14th circa 1986-90 had a great, small, dark basement dancefloor. It is perhaps best known as the place where Tupac’s New York sexual assault charges began. Nell’s had a really strict door policy, but it was still done by coolness, rather than how much money people planned to spend. The cover charge was $5, and they took it from pretty much everyone, at least for the first year. For at least the first two full years we had the run of the place on Thursdays, which was the best night. The DJ, who is still working, and is a wonderful dancer, was Belinda, and I am convinced that she was responsible for breaking Eric B. and Rakim to the right people in New York . Her signature song was “For the Love of Money,” she played a lot of hiphop, and it was the most exciting dance floor you could imagine. It often had combinations like Tupac, Kate Moss, a Haitian drugdealer, Prince, his bodyguards, the Beasties, and Linda Evangelista all dancing at the same time in a group of no more than 200. That was fun. So was the next big place to open, which had a much harder edge to it. Mars was in the Meatpacking district and it was opened by Rudolf of Danceteria and Yuki Watanabe, his Japanese backer. This place looked out on the Hudson River through metal pilings and had a neon sign over the dance floor that said DRUGS. The records that broke there include the the late 80s Public Enemy hits, the Soul II Soul record, “Keep on Movin’,” which was incredibly influential in New York, and a whole bunch of other classic hiphop of the late 80s and early 90s. The best of all New York clubs in the 1980s was the World. This was an abandoned Ukrainian dance hall in the lower east village that was 100 feet from the Toilet, the city’s most notorious heroin spot. The World had a super-strict, totally countercultural door policy, and hosted the U.S. debuts of such talents as the Jesus and Mary Chain and the Pogues. I think that dancing to Street Fighting Man at the Jesus and Mary Chain show at 3 am because the band still had not gone on, and being happy about it, might qualify as the best of times ever. Afterhours at Save the Robots on Avenue B… with real vampires. 5. Can you give a quick tour of the different dancing scenes/times/places y ou’ve frequented? New York City , see above, and in Southampton , New York , in the potato barns turned nightclubs of the late 1980s and early 1990s. These parties were good, with mostly pop music, but this is also where I got my earliest exposure to techno. Places I traveled to where dancing occurred include London, from about 1981 on, where I went to whatever clubs I could find in timeout; does anyone remember a place in an old theater that had a raked dancefloor? That was something. So was Leigh Bowery (pictured). I saw a very good Pogues show at the Mean Fiddler in Harlesden in 1986 I think, and I danced to Haircut 100 at the ICA on or around New Years of 1981. Then there’s Los Angeles , where I went to a vintage warehouse rave in the early 1990s with people who would not do that today. LA has a funny dance club/nightlife history, with 80s hair metal giving way to hard house somewhere around 1993, and lots of the same people somehow attending. The most recent great dance scene I have witnessed was in South Beach Miami for Winter Music Conference 2007. Miami has some of the energy of New York back in the day. I danced on Saturday night at the Wildcat Lounge in Santa Barbara , California to hard contemporary house. It was Memorial Day weekend, a big holiday here, and I felt I saw almost everyone I know, because Santa Barbara is a small town. 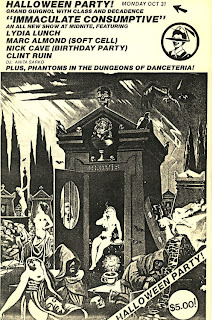 1983 Halloween flyer for Danceteria, New York from the excellent Danceteria blog - where there is a whole archive of flyers from this period.